(Taxidea taxus) Badgers are so agressive they have been known to back down bears when confronted. Our Badger Lotus loves frozen rats and plays with them for awhile when she is given one. 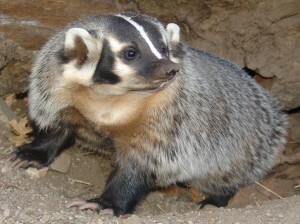 American Badgers are a fossorial carnivore which means they are adapted for digging and living underground. Most of the food they eat, they find underground such as pocket gophers, ground squirrels and moles but they also eat some plants and even poisonous snakes. Badgers have been known to live to about 25 years in captivity, although a life span of 15 to 20 years is more common. How many babies can they have? Badgers can have from 1 to 5 offspring but 3 is the average. Badgers are found mainly in the western regions of North America and also portions of Canada. Badgers are so aggressive they have been known to back down bears when they are confronted. Badgers are excellent diggers and have been known to dig through 2 inches of concrete. Badgers have delayed implantation and the babies do not start developing for a couple of months after mating. Lotus Blossom – She came to the zoo in December of 2005 when she was one year old. She was found abandoned at the side of a road at a very young age and was raised by a rehabilitator. Since she was so young when she was found, she imprinted on humans and could not be released back to the wild. Lotus loves frozen rats and plays with them for a while when she is given one.